If there is one topic that professional journalists just love to report on and analyze, it is the troubles of traditional newspapers. They’re in very bad shape, we are told, and if something is not done these vital institutions might just go away, obviously taking our civilization along with them. There are even pundits who quietly suggest that government subsidies are in order. What is most weird about this (spectacularly self-serving) sort of commentary is that it often actually understates the economic problems that newspapers face. Some papers may stagger on for a few more years or even a decade or two, but make no mistake, this patient is terminal. Imagine, if you will, that newspapers didn’t exist. Now imagine somebody came to you with an exciting new business idea. His plan is to print the news of the day on paper overnight in massive printing plants and distribute copies to driveways in the wee hours throughout the region using a network of motorized vehicles. This operation would be paid for mostly by selling advertizing, but he would also have to charge about a dollar a day to readers. You would tell this person he was crazy. And yet, apparently, many of the people who run and work at newspapers seem to be in denial of the basic fact that the printing of yesterday’s news on paper is an activity that has simply been overtaken by technology. It reminds me of the efforts of Kodak’s management to adapt to the challenge of digital photography. Some things you don’t adapt to. They just obliterate your reason for being. Obviously, it’s the internet that is killing newspapers. There is much hand-wringing over the competition faced by old-style printed news from free web sites, many of them run by the same newspapers that are being killed. Why would anybody pay for a copy of the New York Times when they can read it on-line for free and sometimes a day earlier? Partly, this is a misunderstanding of how the internet is doing the papers in. It’s not NYT.com or CNN.com that killed your local daily, it was eBay, Craigslist, Monster.com, Realtor.com, and a hundred other sites that cooked the local advertizing golden goose. Moreover, there seems to be a widespread unwillingness on the part of the media punditry to confront the economics of on-line news. Much discussion and some efforts are spent on trying to get the free news genie back in the bottle, as if giving it away were some kind of ill-advised experiment that got out of control. Yes, history has shown that people will pay a modest fee for news if they have no other choice. But that’s true about a lot of things. It doesn’t mean that it makes any sense to charge for it or that not charging for it is unsustainable. A few weeks ago Brett Arends in the Wall Street Journal ran a column about the trouble the New York Times was in. Amongst the challenges was that although their currently free websites (principally NYT.com, Boston.com and About.com) were doing well, they generated "just" $300 million or so a year in advertizing revenue. Clearly, Arends and many others argue, they need to find a way to charge the on-line readers. But how could it possibly cost more than $300M to run those websites, including producing the content? Pay 1,000 reporters $100,000 a year and you’ve only burned through a third of the revenues. The answer is that the people who urge the Times et al. to start charging for on-line access are arguing, perhaps unconsciously, for on-line to subsidize the paper infrastructure. And it’s quite an infrastructure. 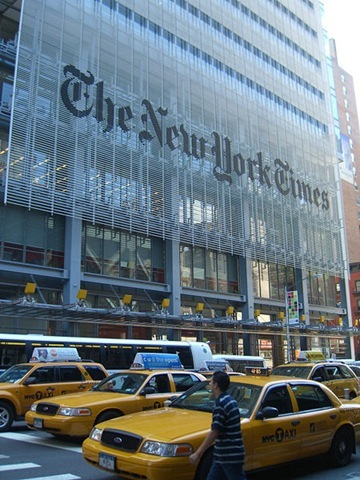 The New York Times corporation employs 9,346 people. How many of those do you suppose are writers, editors, or even advertizing salesmen? And payroll is less than a quarter of operating costs. Besides numerous printing plants, the Times owns a vast fleet of delivery trucks and interests in paper factories in Maine and Canada. This is a considerable industrial enterprise. And it’s an enterprise focused on the manufacture and distribution of a product we just don’t need any more. Speaking as a member of the long-term structurally unemployed, I have authentic sympathy for the printers, drivers, newsstand vendors, and even lumberjacks whose jobs are in peril. But the inevitability of shutting down the industrial infrastructure of newspapers is not a threat to our civilization. I am continually amazed at how little news is in newspapers. By the time the story gets in the paper (and gets to me), I’ve already heard about it from bloggers or other faster online sources and for free and with very little in-my-face advertising and quite conveniently, delivered right to my desktop with a free RSS aggregator (thanks Google). We’re seeing creative destruction. Newspapers are old news. It is as obvious as ink on paper. They’re toast. The rest I could probably do without. 1. Quality: Internet has not just killed dead-tree-based news, but journalism. When most Americans in a post-Kronkite world feel John Stewart is the most-trusted newsman, objective journalism is officially dead. Hierarchical, editor-vetted news is still needed, and most lean net-based operations won’t fill this gaping hole. Not to mention the fact that no payment model has yet been invented that gives you as much good journalism for a buck or three. When people refuse to pay for something, and people who make the news don’t take payment for it, the quality is gone for good. 2. Durability: The internet and PCs use about 20% of America’s power generating capacity today. When we run out of cheap energy resources, the internet will go away. Like Michael Pollan’s pleas for us to re-learn paleo-agriculture in case we need those skills after Monsanto frankenseeds wipe out Iowa, it might not hurt to remember how to pamphlet your city one of these days when you can no longer just log on, log in and screed yourself silly. In general the advantage I find to newspapers is localization. I don’t get local news much from the internet. I imagine that if you live in New York or Los Angeles, this is less of an issue. But in a midsize city, it’s fairly serious. I would imagine that if my local newspaper went out of business, so would their website, which would pretty much black be the end of finding anything about my hometown. Also, difficult to read news online over coffee. My point is that while you pay lip service to the real newspaper killers (Monster, Craigslist, et al), the rest of your article is spent lambasting how useless and irrelevant they are. While it’s certainly true that print reporters overestimate their value (seem to be of the opinion that the death of newspapers will mean the death of democracy), they do nonetheless have value. There is still demand for yesterday’s news printed on paper and delivered to the door. The problem is finding a business model to pay for it. I agree that newspapers are dead. I see it as a serious loss. When people read only the news they choose to seek out, they don’t get exposed to other points of view. Newspapers helped us all know something about the same things and thereby helped us bond. Also, the internet does not yet provide the investigative journalism that was once supplied by the best newspapers. How many foreign correspondents do websites provide? I am sad to see newspapers go. What is the real product of a newspaper? I would say providing information. Is it really that different if delivered via dead trees or WebPages? If they can’t compete with other content providers- like eBay, Craigslist, Monster.com, Realtor.com then they should focus on their own unique content- i.e. journalism. Some owners will figure this out and re-adjust to the new technology. Those that won’t will eventually go out of business. The internet is too useful to just disappear- if power costs sky rocket then much lower power requirements for computers will be a big selling point. For years it has been faster, faster, faster. If economics dictates it will be greener, greener, and greener. Magazines are going to face the same problem soon- it’s just that for extended reading today’s computer screens are pretty poor. Consider how much better the Kindle equivalent will be in 10 years then consider who in their right mind would want to pay for a dead tree magazine. 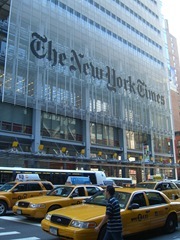 Rob- When I go to http://www.nytimes.com there are a lot of articles I didn’t explicitly choose to seek out. What makes you that would change? If anything an explosion of content makes content collections more valuable not less. If there are people that want to read foreign correspondence or any other content why can’t a web site provide it at a profit? If anything it should be MORE profitable than relying on delivering dead trees. The business models may need to change, but I don’t think that the underlying value of the content has changed. Great points, as usual, Frank. The newspaper industry, in particular, is so frustrating to me. People still want quality news, they still want the credibility of the NYT. They just want it faster–why are they so resistant to restructuring? I suspect if newspapers stop printing today and go 100% online, they would still lose money. Online ad rates are too low. As long as advertisers still pay more for print ads than online ads, newspapers go where the money is. Salon.com is 100% online. It loses money left and right. Bloggers rarely break news. They merely relay news reported by the media sites. Mark Arsenal: If I asked really nicely, could you point me to a source that says the internet & PCs use 20% of power generating capacity? I’m sure I’d enjoy it. TFB, et al. : Clearly, most on-line versions of American newspapers are not sustainable as going businesses, e.g. the Philadelphia version discussed in the linked to Times article. But the Times and a few other big names would make money today. The question worth asking is how many vendors of national and international news do we need? There is undoubtedly a role for local outfits providing truely local news (the corrupt mayor, resturant reviews, how the sports teams did last night) but those outfits don’t need to be very large or expensive to run. I think it is very telling that the smaller newspapers, the ones that never had pretensions of covering national news themselves, are doing relatively better than the likes of The Philadelphia Inquirer. This is a bad time for newspapers, but this is a great time to get news. I like to get foreign news direct from foreigners and not through an American “gatekeeper” like the NY Times. I used to have to (1) listen to shortwave radio (spotty reception), (2) get the “Economist” (which is not a daily), or (3) wait at least a week for the Times of London to arrive. Now I just get onto the Times of London site (or the Jornal do Brasil site or the Dagens Nyheter site). Lots of news items are screened out by the gatekeepers: for example, the Amanda Knox story was not covered much here, but was a huge deal for the British press. In addition, there are foreigners who run blogs who offer their own news from their countries. Sure, it may be via a media feed, but that feed is from their own media and not from ours. There’s lots of things they talk about that just never make it into our media. JFP – Yeah, I’m not sure why the Amanda Knox article didn’t get much coverage. I wrote about it on by blog. Fascinating story. As a follow-up to Frank’s comment — in the most recent DOE survey (from 2001) computers accounted for 2.0% of household energy consumption. (See http://www.eia.doe.gov/emeu/recs/recs2001/enduse2001/enduse2001.html ) This survey neglects all industrial and commercial usage, but I suspect that computers are an even smaller percentage in those categories. Air conditioners were the largest household electricity user, at 16%, eight times computer usage. Personally I believe that newspapers killed themselves by changing from simply reporting the news to framing the news from whatever political perspective they deemed to be appropriate. I don’t feel that I can trust any newspaper to provide me with the facts on any subject. If I read an article the first things I ask myself are … what is not being said? what statements in the article are really assumptions and are those assumptions truly valid or based on a political bias? The vast majority of articles, when viewed in light of those questions, reveal a truly appalling dishonesty. @Rick, It’s not just power, but if there is no petrol, we can’t mine the silver and copper and silicates needed to make IT possible. IT is a cheap energy-enabled industry. BTW: I always find it interesting that whenever I mention the limits our current technology presents to a world of scarer energy, everyone talks about how the “market” will find solutions and how “they’ll” invent more efficient stuff. People sure have a religious faith in the technology gods to solve all our problems, but no one seems to actually know these gods nor be them. JFP & Kosmo: Amanda Knox? Seriously? This is what you think is wrong with the American press? Not enough coverage of Amanda Knox? Mark Arsenal: Thanks, will read. The article that Mark Arsenal linked above makes the point that microelectronics are horribly energy intensive because they have a higher energy consumption per kg of material produced. While this is certainly true, it completely ignores that we produce comparatively few kg of computers. For some back of the envelope numbers — there are now roughly 1 billion personal computers world-wide. Assuming an average weight of 10 kg (22 lbs, which is probably right within a factor of 2), we get a total weight of computers in the world of 10 billion kg, or 10 million metric tons. Compare this to the current annual United States steel production of roughly 100 million tons — the total weight of all computers in the world is roughly 1/10 of the total weight of steel produced in the United States alone each year. The numbers that Mark Arsenal is proposing just don’t add up. Look at the problem in a different way — total US industrial electricity use is slightly smaller than residential use. Computers account for roughly 2% of residential electricity use. To get to the 20% figure that Mark claims, computer manufacture would have to account for somewhere in the range of 30-50% of total manufacturing use. The numbers just aren’t there. This reiterates a theme which Frank has brought up from time to time — apocryphal numbers often fly around, uncriticized, although they may have no basis in fact. @Kelly, you also have to consider the energy to mine copper and silver for cables and silicate manufacture for fiberoptics. Then there are data centers, which are huge energy suckers (I know, I work for one). Switching houses, telephone charging, handset manufacturing, the battery drain from all the new electronics in automobiles. I would assume that a comprehensive study would in fact indicate that my 20% figure is an understatement on the load the internet/network computing places on our fragile industrial society. To get back to the original point: I have yet to be convinced by anything here that the demise of print media is a social good. I find higher dependence upon increasingly-slanted “instant information” frightening. It is the cause of the town hall meetings that are degenerating into screech-fests; bloggers are not journalists – they will never look as cool in a film noir about a stogie-puffing expose chaser. That’s just the way it is. Celebrate it if it makes you feel bigger, but it’s a loss for us all. As long as I’m reading my news on the john, I’ll be buying newspapers. You haven’t shown that your 20% figure is anything more than a WAG. After reading it, I think the methodology of the article that you cited is deeply flawed, and the numbers in it are awfully fuzzy. End use electricity consumption for computers is on order of 2% of the total. Come up with some hard numbers that actually show that the total power consumption from computers and the Internet is an order of magnitude higher and I’ll be happy to look at them. Your assumptions don’t prove very much. To get back to the point about newspapers — I would be much more inclined to mourn them if they actually produced a quality product. Most daily newspapers are, unfortunately, wretchedly bad. Produce a bad product and people will turn away. Great points Frank. We don’t need the New York Times Corporation; we need investigative journalists with integrity. They are different things. I strongly disagree with those inclined to feel sentimental about a corporation with a strong brand. It proves both the power of marketers, and the ignorance of people. Just as the scientist character in Jurassic Park said “life finds a way”, I’m sure elements of newspapers that are integral to our society will continue regardless of corporate parentage. You didn’t even read my reply. You’re talking about electricity, I’m talking about energy. Network computing requires PCs, data centers, fiber optics, copper, plastics, and all the human resources that back them up. Economic activity is based on energy inputs. Generally, one unit of energy creates a certain amount of economic value. I’m trying to say that the economy that made the internet posible was based on cheap and abundant energy, and that’s going to go away.